Assorted cover scans for Avatar Press’ comic book series are now available at a higher resolution. See them under Comic Books. Pete von Sholly, storyboard artist for A Nightmare on Elm Street 3: Dream Warriors, graciously supplied us with some additional storyboard scans from the “Freddy Snake vs. Nancy” sequence. You can view them under Storyboards. 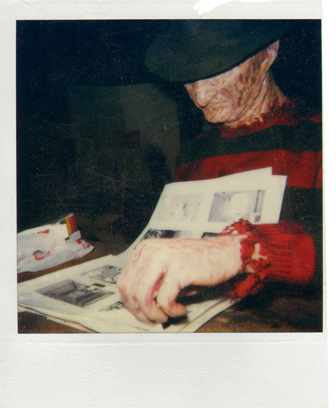 Further, he permitted us to post the following candid Polaroid of Robert Englund on set, as Freddy Krueger, looking over his storyboard portfolio. Enjoy! Special thanks to Maurice Mitchell and Pete von Sholly!